In order to provide a storm water detention basin/lake and to retain the embankment soil beneath a proposed, five-level, luxury, residential condominium complex; the owner/developer’s project design team proposed and designed a precast concrete T-Wall Retaining Wall System. 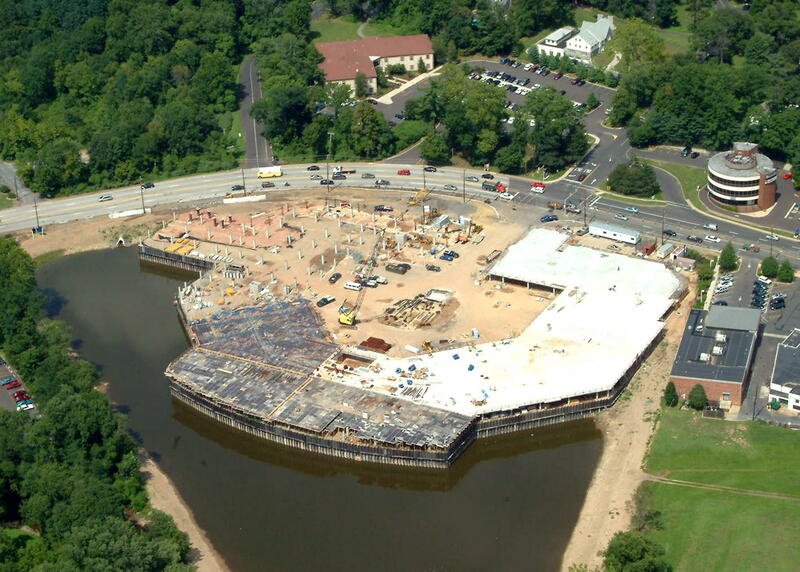 The over–budget project was nearly cancelled until the contractor proposed, and the developer accepted, the design and construction of an alternate steel sheet pile bulkhead. Fronting the detention basin/lake, this bulkhead is 1,400 feet long with an exposed height of 21 feet. The steel sheet piling is tiedback laterally by a system of high strength threadbar tie rods, double channel wales, and reinforced concrete deadmen located beneath the lower, ground level garage of the building. Project challenges included installing the tie rods and deadmen around driven foundation piles and the irregular building footprint. In addition to providing a significant cost savings to the developer, construction of this alternate sheet pile bulkhead wall trimmed 4 months from the project construction schedule and minimized disturbance of the adjacent wetlands. Last minute redesign of the completed wall allowed the owner/ developer to add an indoor, in ground swimming pool directly behind the wall.